TCS John Huxley is a top manufacturer and supplier of gaming services. However, it was struggling to adjust to Salesforce automation and reporting successfully. TCS John Huxley engaged with Simplus, anxious about finding a partner who would understand and address its needs after a bad experience with a previous partner. Simplus came onto the project and delivered in full. After manual input and sending reports through scanning and a shared drive, the TCS John Huxley team members were ready for a change. Simplus helped the team work on a budget and still provide a rewarding Salesforce solution. 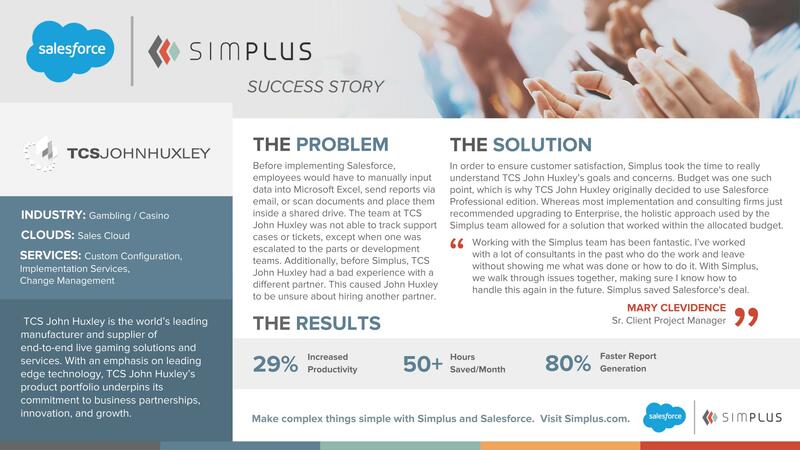 Simplus’ holistic approach to TCS’ needs meant that TCS John Huxley wasn’t just happy with the results, but also the ending cost. We walked through issues directly with TCS to ensure its team knew how to handle similar situations in the future and feel confident using Salesforce. Ultimately, it made for 80% faster report generation, over 50 hours saved a month, and more.